Grandsons of the legendary Gottuvadyam Narayana Iyengar, Shashikiran and Ganesh are cousins who sing as the vocal duo Carnatica brothers. 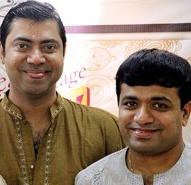 The Carnatica brothers stormed the Carnatic music world at the age of two as child prodigies and have since emerged as front-ranking musicians. They have performed extensively in India and in USA, UK, Canada, Australia, Singapore, Malaysia and UAE. They now have a vast experience of over 3500 concerts, lecture demonstrations, jugalbandhis and fusion concerts. They have garnered critical acclaim and popularity with their emotive style of singing and their strict adherence to classicism. On September 9th and 10th 2006, Shashikiran and Ganesh performed a marathon 24-hour concert – a stupendous effort, considering the fact that they did not take a single break during the entire 24 hours. The concert was dedicated to all those who lost their lives in the various natural calamities and terrorist strikes and to mark World Peace Day. They have been accompanied by senior musicians including Sangita Kalanidhi Umayalapuram Sivaraman, Sangita Kalanidhi T.K.Murthy, Sangita Kalanidhi Vellore Ramabhadran, Guruvayur Durai, Mannargudi Easwaran, Thiruvarur Vaidhyanathan, Srimushnam Raja Rao, K.V.Prasad, Trichur Narendran and Kamalakar Rao on the mridangam and M.S.Anantharaman, Nagai Muralidharan, M.A.Sundareswaran and V.V.Ravi on the violin. Yuva Kala Bharati (Bharat Kalachar, Chennai), Gandharva Vidya Dhara (Irai Pani Manram, Chennai), Best Pallavi Award (Music Academy, Madras), Best concert Award (Narada Gana Sabha, Chennai and Music Academy Chennai ), Best Pallavi Concert Award on the Chitravina (Karnataka Gana Kala Parishad), Maharajapuram Vishwanatha Iyer Award and the Asthana Vidwan of Kanchi Kamakoti Peetam.